ABERDEEN, Md. — A woman working a temporary job at a drugstore warehouse in Maryland got into an argument at work Thursday morning and began shooting colleagues, killing three before fatally turning the gun on herself, authorities and witnesses said. The incident took place at the Rite Aid distribution facility in Harford County, Maryland. Workers at the facility described terrifying moments of "crazy" gunfire and people screaming and running in all directions after the shooting. Others said they helped the wounded, one person tying blood-soaked jeans around a man's injured leg in a bid to stop the bleeding. The suspect was identified as a temporary employee at the distribution center, according to Harford County Sheriff Jeffrey R. Gahler. The sheriff's office identified her in a tweet as Snochia Moseley, 26, from Baltimore County. It appears only one weapon, a handgun, was used, and no shots were fired by responding law enforcement officers, Gahler said. The shooter used a 9 mm Glock that was registered in her name, he said. She died at a hospital from a self-inflicted gunshot wound, he said. Witnesses said they saw multiple police departments and ambulances responding, CBS Baltimore reported. The ATF and FBI also responded. Krystal Watson, 33, said her husband, Eric, works at the facility and told her that the suspect had been arguing with somebody else near a time clock after a "town hall meeting." Colleen Hendrickson lives and works nearby, and she thought it was a normal day while heading to catch the bus and head to work, but then someone warned her there was an active shooting nearby. "It's mostly warehouses in the area," she said. "It's usually just a really sleepy place." 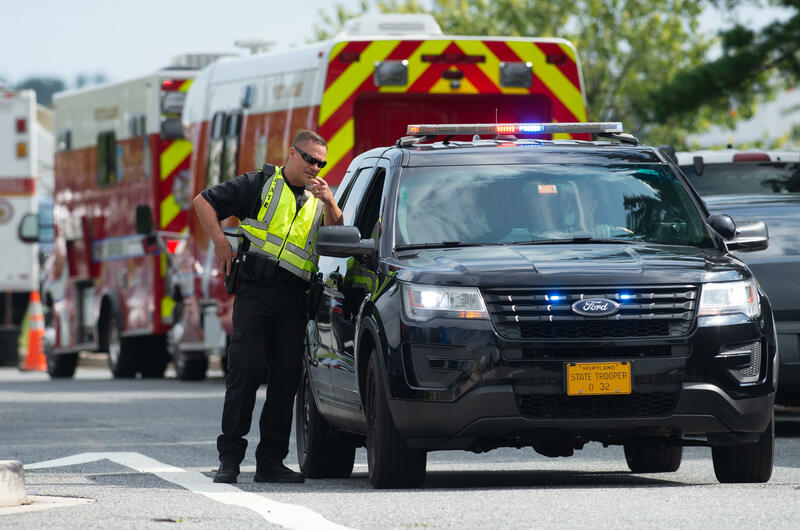 Thursday's rampage happened almost three months after a man opened fire inside a newspaper office in Annapolis, Maryland. Five staff members were killed in that shooting. Authorities accused Jarrod W. Ramos of attacking The Capital Gazette because of a longstanding grudge against the paper. In a tweet, Maryland Gov. Larry Hogan said his office was monitoring the situation in Aberdeen and the state stands ready to offer any support. He called it a "horrific shooting." Susan Henderson, a spokeswoman for Rite Aid, said the shooting unfolded on the campus of a company distribution center in Aberdeen. She described it as a support facility adjacent to a larger building. Walter Zambrano, 64, who described himself as a worker at the distribution center, said he was in the bathroom when the shooting broke out and saw nothing as he hid, frightened for his life. He said the gunfire seemed to go on for several minutes, and when it was over he sprinted outdoors. On the way out, he said he saw a female co-worker down on the floor. The scene, he said, was one of chaos. Dominique Norton, 33, of Aberdeen, endured an excruciating wait of nearly two hours to be reunited with her mother, 62-year-old warehouse worker Irene Norton. Dominique Norton said she didn't know that her mother was unharmed until she got off a bus at the fire station and they tearfully embraced.